Patience Murphy is a midwife in Appalachia during the Depression, in a time when the Ku Klux Klan was showing it’s ugly face, and when the local doctor refuses to help colored women in labor. She lives to help others, but she lives in fear-Patience has her own ugly secrets-a dark past that hangs over her and could ruin her life if her secret got out. This is a novel about unlikely relationships that become lifelong friendships, the pain of loss, the healing powers of love and compassion, and the heart that comes out when people have nothing else to give. The hardship of the area and the times will bring tears to your eyes as you read this novel and imagine what it might have been like to try and make, then raise, a family during a time of intense poverty when medicine was not advanced, or simply unavailable to the lower classes. Desperate times bring forth some very productive change, and the lessons learned by this kind, stubborn midwife as she travels her path, helping the birthing women of Appalachia and learning that love has no cost and no color. This novel is NOT for anyone who is squeamish about childbirth related topics. The births are quite graphic and the description in the entire novel is breathtaking-which means that if you can’t talk about placenta or umbilical cords you should probably leave this one alone. 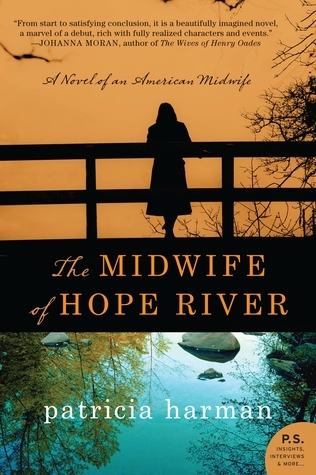 If you like to read novels that step outside the box, The Midwife of Hope River , by Patricia Harman, is one of the most eloquently written pieces of women’s fiction on shelves today.